Absolutely the best site i have seen in many a' moon. I could get lost on your site & still be happy with just this one. You show that there's more than 1 side to almost any question. I love it. Please view the Awards section. I just recently got on the web, your site was one of the first I hit. I've been in heaven ever since. Keep it up! Absolutely incredible website! I am so glad I found it. I haven’t been able to tear away from it as it has been answering so many of the questions I’ve had. It is a perfect repository of information of all the things we wish to learn about. Who we are.. where we come from and why. With references and links from very compelling authors and scientists, people can be sure that they are getting very useful information. My hat is off to you. Keep adding more! I cannot help to express my congratulations for your wonderful website. It is truly one of the best on the Internet, not only in regards of the contents but also in terms of presentation and navigation. A real pleasure! After browsing World-Mysteries.com, I am able to say that it is one of the best sites I have read for years. Clear and concise, pleasing to the eye and neatly categorizing the most important Mysteries for all to see. A researchers delight. May it continue to flourish and open the Mind. Your site is very cleanly laid out; it even looks better than mine! Quite an elite site you have! Very professional and graphically defined. I will need more time to thoroughly examine the many unique aspects of your site. Very nicely done, clean, no clutter. Good info. Congratulation! You have an excellent web site. Your site is well organized and filled with a wealth of interesting information. While reading it I am learning all kinds of new things I knew nothing about. Your bibliographies indicate that your information is much more reliable than the typical web page. After visiting it again, I realize that I've seen your web site before and it is very nicely presented though I don't necessarily agree with much of the content. You have obviously put a lot of effort and study into your site. Well done, great job, keep continue! I think your site is GREAT! It is very informative and well organized. which I find thoroughly enjoyable... You've got a great looking site! You have an exceptional site. I fell in love with your site this morning. [...] Keep up the great work. Good luck with your site. It's a gem! I am sooo excited, World-Mysteries.com has become my new favorite site! If I could hug a web site I would hug this one for sure! Before your site appeared to me, I was considering creating a similar site. After I felt no need to. I have a passion for Mysteries, Archaeology, History, etc. Your site is extremely ..."knowledgeable"
Thanks to the "yahoo pics", the website that I've been searching for has been found! It's taken a couple years to find it, but definitely worth the wait. One must always question "mainstream" beliefs, and never just blindly believe. Thanks for giving us "doubting Thomases" a place to gather!!!!! Dear World Mysteries, I think I found your website by a Yahoo newsletter, and I was glad I found it! Your information about Science Mysteries - Parapsychology is one of the best sources I have found about the subject - I had looked in libraries, bookstores, and the internet, but your information is clear and is what I have been looking for. 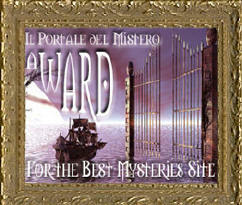 World-Mysteries.com has been reviewed and chosen to bear the 2002-2003 Golden Web Award. 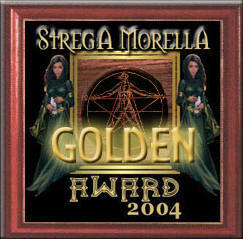 World Mysteries has been reviewed and chosen to bear the 2003-2004 Golden Web Award. This is by no means the definitive guide to solving the great mysteries of the world, but its collection of essays and explanations are extremely entertaining. Doug Yurchey, for example, looks at Nostradamus' prophecies and whether they really refer to the September 11 attacks. Fans of John "I speak to dead people" Edwards might like to read the discussion of psychic phenomenon, where author Rich Anders delves into near-death experiences and ouija boards. And just how did the ancient Egyptians construct those huge pyramids? Will Hart gives us his perspective, and takes a swipe at current scientific thinking in the process. WOW- loved it . I have always been interested in this subject as a layman. The site has everything. I like the way you fade one subject into another. I will be visiting "World -Mysteries often. I am amazed with amount of information about ancient history, theories and mysteries in your website. The presentation of information, references and picture elements are remarkable. Keep the good work and enlighten humankind with your collective information and knowledge. I would like to express my great satisfaction with the great layout and very useful information which you provide. Just keep up with the great work. Dear Webmaster of World Mysteries, after viewing your site, we can see the hard work you put into it. We loved it all, you did a Fantastic job. Our site is the first Italian Portal of Mysteries, inspired from a true history. This site is created and maintained only by volunteers opera and from the large passion. Please, accept our Exchange Awards in mark of friendship and admiration! A big “Ciao” from Rome! Hello, sirs & friends, I am Deepak Shinde from India. You gave us a supergift as world-mysteries.com. I am interested learner & wish to find something in history. I like your DENDERA, NAZCA, and such something other presentation so much. its beautiful. Thank once again for this site. Wish you all the best for future to find more and give us. This is your extra ordinary talent. After reading one of Sylvia's books, I noticed a reference to your web site. All I can say is WOW! I've been wasting my time on other things when I could have been absorbing all this. I am so amazed by all this information...it's exactly what I have needed to see. Thank you so very much. It's a dream come true. Your website is fantastic and my eyes are currently sore from looking at all the illusions!! I am 11 and have a project at school about artists. This website has really helped me choose my artist while being very fun to do too!! I just wanted to email you and say THANK YOU for the wonderful resources you have gathered. My research is taking me deeper into hidden ancient artifacts / knowledge and I have found myself going to http://www.world-mysteries.com for several source references. Absolutely the best site i have seen in many a' moon. I could get lost on your site & still be happy with just this one. You show that there's more than 1 side to almost any question. I love it! Search Engine Rankings for the desirable keyword, "world mysteries"
If you would like to advertise with us, we can help you to promote your website or product (subject to our approval). Please send us an e-mail request and we will reply to you with more details. WORLD-MYSTERIES.com is featured on many other web sites. We are happy to reward a site dedicated to the mysteries, useful and exhaustive like this. Your web, aims to the practice rather that to the graphic support. However this is able to be a large quality, when the contents are interesting and complex. Our compliments are dedicated also to the technical support that does swift and intuitive the pages. In the complex this site is an excellent opera! World-Mysteries.com web site has been launched on March 26, 2002. 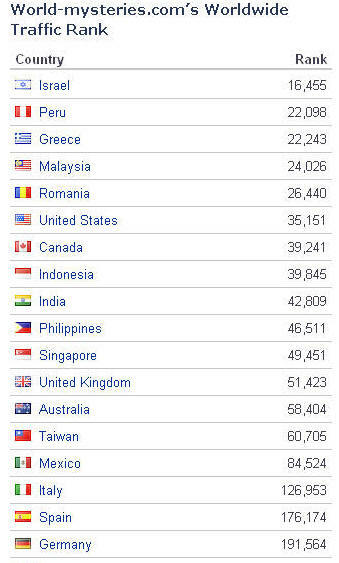 Since that time our traffic reached high volume. for the desirable keyword, "world mysteries"
More subjects will be available soon. Please visit us again. World-Mysteries.com, our ISP or any sponsoring individuals or organizations.